Going whole hog figuratively but half hog literally, this year I purchased a half pig from Bare Knuckle Farm and had it broken up into primal cuts to further process myself. I cured and smoked bacon and a whole ham and with the help of friends made a bunch of fresh sausages to stash in the freezer. 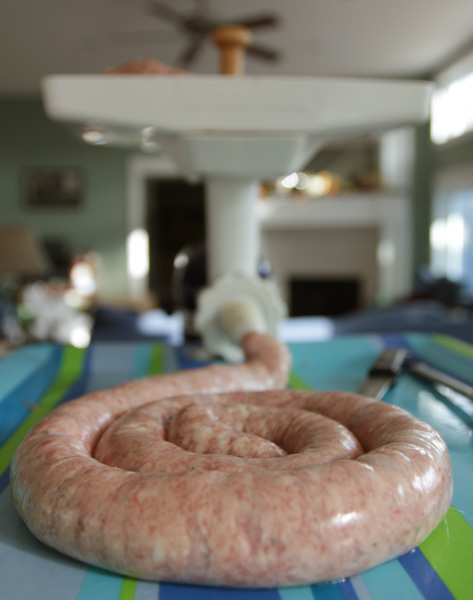 Not only has this been a project I've wanted to try for awhile but it's also a way for us to have locally, responsibly raised, pork sausage without the risk of sneaky milk powder, which my son Alex cannot have. For all my pork preparations I followed the instructions in the book Charcuterie by Brian Polcyn and Michael Ruhlman. This book is amazing! 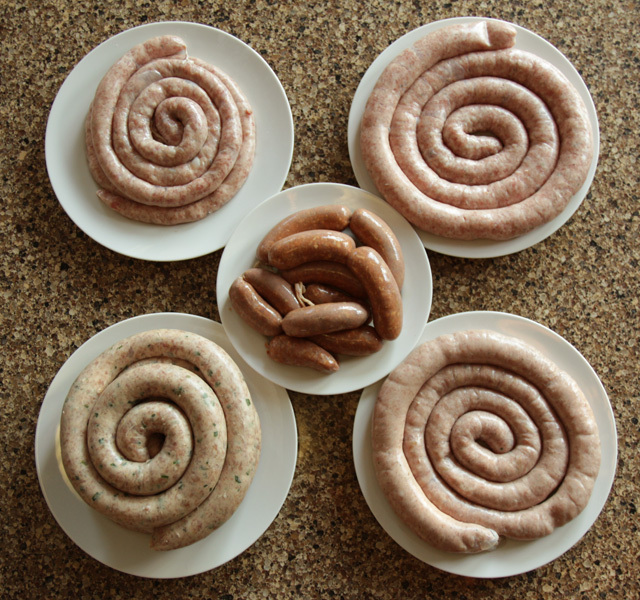 The directions are detailed, easy to follow and very helpfully they include a basic ratio for fresh pork sausage. The tough part was deciding what flavor sausages to make. We ended up making a maple breakfast sausage (with my maple syrup), a basic herb garlic sausage (sage and rosemary from my garden), a chorizo-like sausage with smoked paprika, a garlic chive/ginger sausage (similar to the meatballs in this soup), and apple/anise seed. 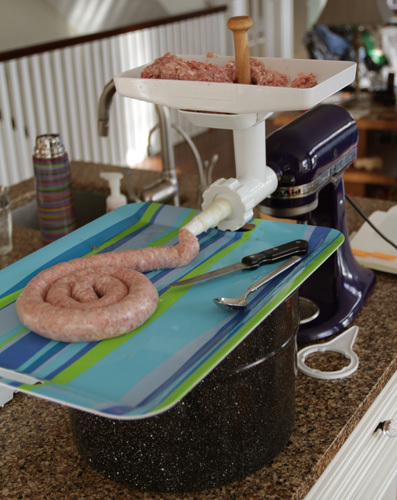 I already owned the KitchenAid meat grinder attachment but went ahead and bought the sausage stuffer attachment in spite of the bad reviews. At times burping out the bubbles of air got a little tricky but by creating a raised platform to catch the stuffed sausages I thought it worked decently, worth the space and money saved compared to buying a dedicated sausage stuffer. You can see my set up in the photos. I also highly recommend the food tray attachment. Why didn't I know they had that sooner! 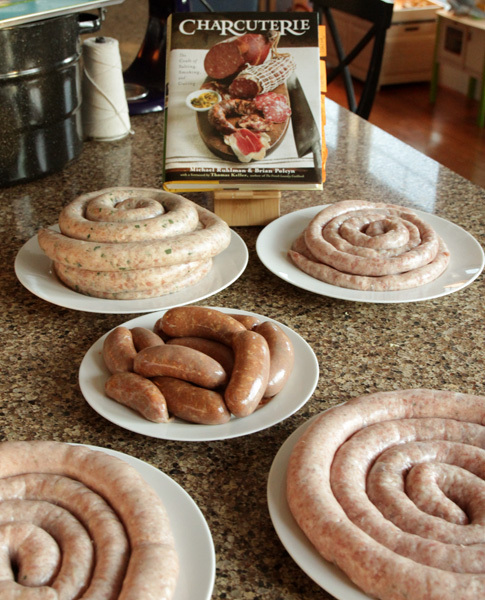 Mentally prepare yourself for the lewd *sausage* jokes your husband will make repeatedly, there is no stopping him. Have a pot of soup on for the meat cutting. We were starving and needed a break from our sausage testing nibbles. Don't bother with the breakfast sausage sized casings unless making hot dogs too. Instead make sliceable logs of breakfast sausage. Weigh the ham before sticking in brine to accurately get curing time. I forgot and had to guess. The ham was still edible (and good) but it was half ham and half pork roast. Add some cloves, maybe other spices to ham brine. Don't wait until next year to get another pork belly, homemade bacon is so awesome! Note the labelled tags for quick reference, I highly recommend doing this. With my mommy duties, I couldn't participate in most of the recent event in our town, Pigstock TC. A pork enthusiasts dream, you can read more about Pigstock in this My North article. I did get to go to one of their events open to the public, a breakdown of a half hog, and took a bunch of photos. It was incredibly helpful and maybe next year I'll do the job myself.